Stews, chilis, soups or even healthy pasta – I love preparing hearty, warming dishes loaded with nutrients, especially when the slow cooker is included. This kitchen gadget is the ultimate time-savior, helping you maintain a healthy diet without wasting time with long cooking steps. While some of the vitamins are lost within the cooking process, the minerals, protein and fiber remain intact. Just make sure you serve your stew next to a salad to ensure your body gets fresh enzymes and vitamins too. And there's nothing as comforting as a bowl of home-made stew, wonderfully flavored and packed with nutrients to keep your body in great shape! 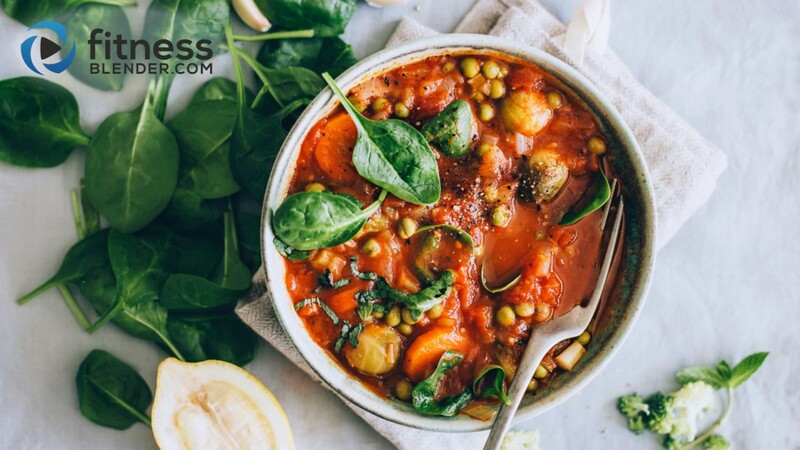 I always combine different classes of foods to get the maximum health benefits from my stew – chickpeas, tofu, beans, peas or lentils, to add plenty protein and fiber to the dish, and lots, I mean, lots of vegetables for a rich mineral intake. There isn't a specific recipe for creating the perfect stew – just make sure you add plenty of ingredients to nourish your body with a wide variety of nutrients. Quick tip: start your slow cooker stew & then fit in a 30 minute workout video while it cooks! The best vegetables that goes well with slow cooker stews are the root vegetables, especially sweet potatoes, carrots or potatoes. Their starch creates a probiotic nourishment for your microbiome, resulting in increased vitamin absorption and a great boost for the immune system. Cruciferous vegetables, such as broccoli or brussels sprouts enrich the nutritional values of your stew with essential minerals magnesium and potassium, and also with fiber, both soluble and insoluble. Your digestion is improved, the health of your colon cells is protected, and it's easier for your body to eliminate the toxins, old estrogen and cholesterol, preventing them from leaking back into your blood stream. The secret to creating a tasty slow cooking stew is adding enough garlic, onion and aromatic herbs to create a wonderfully flavored thick broth that keeps all the ingredients together. I add aromatic herbs with the rest of the ingredients and let them infuse the vegetables with their flavor, and also sprinkle freshly chopped ones when serving the stew, for a nice styling and refreshing taste. Basil, sage, parsley or mint work just perfect! If you want to enrich your stew with green leafy vegetables, I recommend adding them when the cooking process is finished, because cooking destroys some of their detoxifying nutrients, especially vitamins, and they will lose color and health properties. Spinach, kale or chard, they make a delicious and healthy addition to your stew, and give it an alluring, vibrant color dash. Heat the olive oil into a cast iron skillet, add the onion, garlic, bell pepper, peas and carrot, and cook for five minutes over medium heat, stirring frequently. Add the turmeric and black pepper, and stir to incorporate. Transfer the mixture into the slow cooker, add the beans, tomatoes, sage, mint and vegetable broth, vinegar and maple syrup, mix well, cover. Add the spinach leaves and mix to to incorporate. Serve warm, garnished with fresh herbs and drizzled with fresh lemon juice. This strength building program cycles muscle groups and training styles to help you safely and efficiently train 5 days a week for size and strength gains.